While this is not the first time that such violence has hit Assam, impact wise, this violence is one of the major tragedies of the area. The strife between ethnic groups and Muslim minority, that are labeled as ‘Bangala Deshi Infiltrators’ has been going on from last many decades. The local issues have been given the color as if the problems are due to the illegal migrations. It is propagated that the time bomb is ticking. Such a propaganda is accompanied by the slogan ‘Assam for Assamese’, this is very similar to the one floated by the parochial Shiv Sena in Maharashtra, which has been doing violence on the slogan of ‘Maharashtra for Marathis’. The roots of this Assam conflict have been in the society, which have been ignored by the state and central governments. A decade later, series of violence took place, the victims of which are still living a pathetic life in the refugee camps. During early part of first decade of this century, the demand of Bodos was met with the formation of Bodo Territorial Autonomous Districts after the treaty with Bodos. The districts covered in this territory are Kokrajhar, Chirang, Baksa and Udalgiri. As per agreement the Bodo militants were to surrender their arms which they did not do, with the result many of them continued intimidating others. The percentage of Bodos in these districts varies from 22 to 29% according to different estimates. The others are the Santhals, Rajbangshis, Adibashis and Muslims. Despite being in the minority, with full powers in the region, the Bodos initiated policies where by non Bodos have been neglected in different aspects of their lives. The condition of these groups is very bad and they are against the formation of Bodo Territorial Council. In this area, the present carnage was preceded by the rumor that people from Bangla Desh have come with large number of armaments. This got triggered into violence leading to the present tragedy. The Chief Minister of Assam has denied any such ‘foreign hand’. The real issue has been the pressure on land and jobs due to the natural rise in population over a period of time. This pressure has been deflected by saying that it’s all due to the Bangla Deshi infiltrators, a phrase very popular all over the country and more so in Assam. True, the overall lopsided development has caused the pressures on employment all over the country. In a place like Mumbai, this got presented as being due to immigration of non Marathis into Maharashtra. While in Assam the added part of parallel politics is that the problem is projected on to the foreigners. Is that true? The propaganda by communal forces about so call infiltration by Bangle Deshis has assumed huge proportions. It has become the part of the mind set in India; it was also at the backdrop of many agitations in Assam. Surely the basic issue of lack of development in Assam has been deflected by political groups including communal groups as being the issue of displacement of locals from their lands by infiltrators. 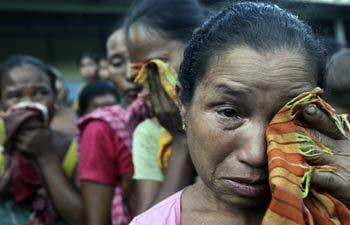 Case of Assam has a mix of Mumbai’s Shiv Sena politics, mixed with ‘communal-foreigner’ tones. The issue has also been the one related to Adibashis, the ethnic component has also been a part of the whole thing. Crucially right from Nellie to the present violence, in which displacement is the most dominant factor, the infiltrator propaganda has prepared the ground for carnage. What is required today is to disarm those having arms of various types, to rehabilitate the refugees and to ensure that they are able to go back to their own areas to catch up with the sowing season. If this is not met, surely a bigger disaster of food deprivation is baying for all the year. What is also needed is that the myth of infiltrators is to be debunked for good by scholars and activists who have observed the pattern of population profile during last one century. The communal forces have misused this very word of Bangla Deshi infiltrator. And lastly the wounded psyche of communities needs to be healed by a process of dialogue and justice.